Diane Debevec is a visual artist living and working in Cincinnati,Ohio. Several years ago she left a corporate career to explore her love of painting. In addition to landscape, Diane's imagery includes waterscape, dogs and chairs. 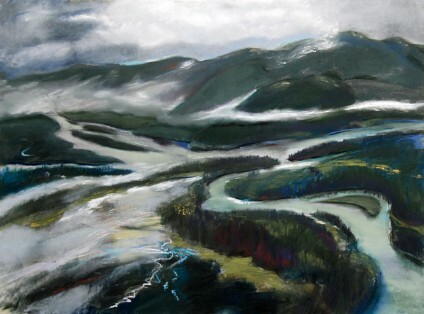 She shows her work regionally and has completed a number of commissioned paintings. Diane's re-created life includes an urban community known as Artful Habitats, where she provides unique apartments to creative city dwellers. She resides there with her husband, Jeff Smith (photographer), dog Sydney, and the inimitable Audrey the Cat. Diane also loves the art of writing, and is employed as the Director of local non-profit Women Writing for (a) Change. Her art studio is at the Essex Studios in East Walnut Hills. Thanks for visiting Diane's website: she welcomes your comments!